Note of February 2014: See the comments section for information on descendants of Ichabod Boothby. 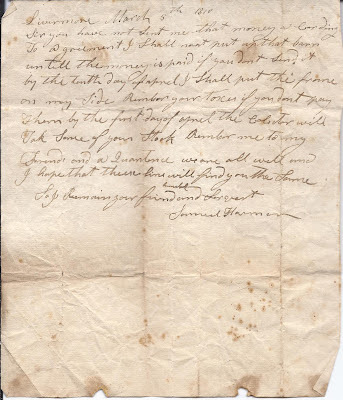 5 March 1810 letter sent by Samuel Harmon at Livermore, Maine, to Ichabod Boothby at Scarborough, Maine. Approximately 8-1/4" x 7-1/4". Both of these men had connections to Scarborough, Maine. They were most likely both born there and at some point went to Livermore, Maine. Ichabod may have been on an extended visit to Scarborough at the time of the letter. Samuel Harmon proved difficult to research. I found several sources that danced around a Samuel Harmon in Livermore but nothing substantive. He may have been the Samuel Harmon who was born at Scarborough, Maine, about 1767, the son of John Harmon and third wife Abigail (Hoyt) Harmon, and older brother of Dodavah Harmon, who also moved to Livermore. 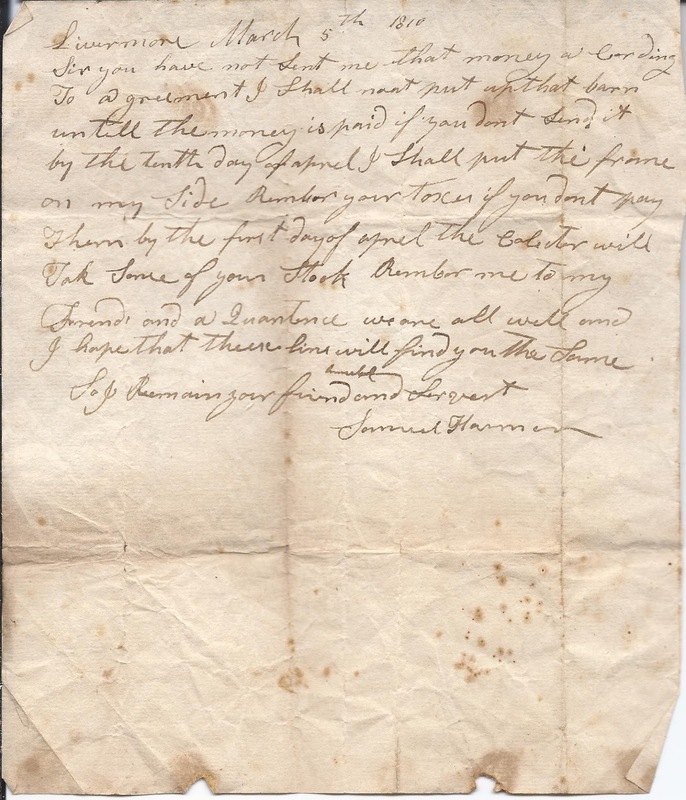 Aside from building barns, as implied in the letter, he may have been the Samuel Harmon who had a shoe making business at Livermore. And he may have been the Samuel Harmon found in the 1830 Census of Livermore. Hopefully a reader will come forth with more information on Samuel Harmon. Ichabod Boothby, assuming I have the correct one, was born 30 May 1789 at Scarborough, Maine, the son of Nathaniel and Susan (Thompson) Boothby. His paternal grandparents were Ulster immigrant Samuel Boothby and his wife Esther (possibly Burbank) Boothby. 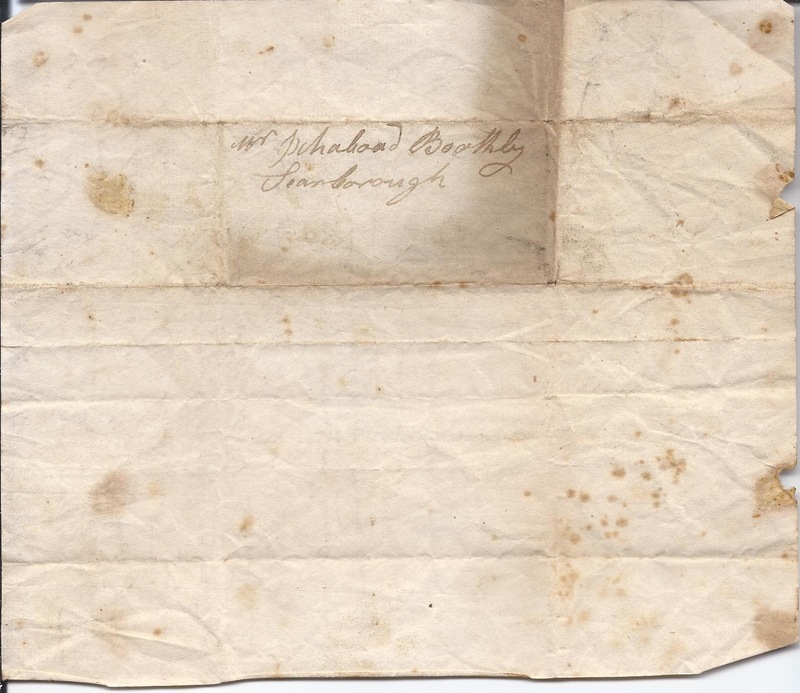 Ichabod's maternal grandparents may have been John and Sarah (Means) Thompson. Ichabod married twice: 1) Charlotte Knight, with whom he had Levi, Charles, Prudence and David; 2) Rebecca Jones, with whom he had son, Eleazer. If you have any corrections to the information above, or any insights into the Harmon and Boothby families, please leave a comment or contact me directly. Sir, you have not sent me that money according to agreement. I shall not put up that barn until the money is paid. If you don't send it by the tenth day of April, I shall put the frame on my side. Remember your taxes; if you don't pay them by the first day of April the Collector will take some of your stock. Remember me to my friends and acquaintances. We are all well and I hope that these lines will find you the same. A treasure! I wonder if the barn got built! Ichabod Boothby's my 3rd great grandfather, 2nd great grandparents his son Charles Henry Boothby Sr. m. Betsey Wheeler Hiscock, great grandparents their daughter Cora Prudence Boothby m. Welcome Fitzroy Fuller (storekeeper/postmaster in Brettons & N.Turner, adjacent to Livermore, Maine.) 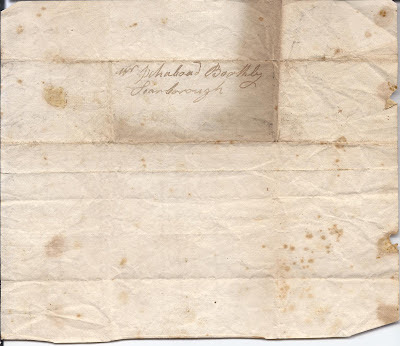 I also have A Margaret Harmon m. Ichabod's older brother, Nathaniel Boothby Jr. 12 Feb 1843 in Scarborough, so hopefully this barn bill family rift was smoother over! This is great information, Deb - thanks so much! Am making a note in the body of the post to direct readers' attention to your comment.